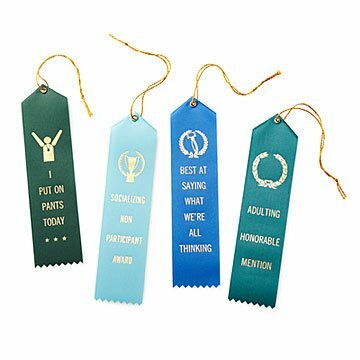 Celebrate the real achievements—like putting pants on—with these adult award ribbons. You remembered to brush your teeth this morning and were only 10 minutes late to work. Now that deserves a gold medal! These ribbons may look like your standard spelling bee runner-up award, but let's face it—you haven't won anything that big in years. Rather, celebrate the fact that you put pants on today or accomplished the least party socialization. You know, the real achievements. Stir up your next gathering or hand them out to the people who are most deserving. "Best at saying what we're all thinking," we're looking at you Aunt Cindy. Made in New Jersey. Got these as something funny to give to my daughter...who just graduated from college and is back at home...as she takes steps to begin 'adulting'. These ribbons were so funny and everyone at work really enjoys them. Great fun gift idea for any reason or no reason. Ithink this make a fun gift for anyanyt,no need for a special occasion. A bonus is the reasonable price. We hosted a retreat for a small group that involved conference sessions and socializing. When we came to the end of the sessions we selected 4 people to win these awards - they were surprised and charmed, and everyone was totally amused. Bought these for my husband for fathers day and he thought they were hilarious!